Energy is an necessary part in our life. With the development of social economy and the increasing of human’s demands, non-renewable resources has arisen serious shortage, which has also seriously threaten our development. In recent years, more and more energy dispute has appeared in many countries and even caused the armed conflicts. War and conflicts are what we least want to see. The appearance of Beston pyrolysis plant just likes a welcome rain for us in this situation. The plant mainly uses living waste, medicine waste and industrial waste as raw materials, such as waste plastic, waste tire, and used rubber, to produce fuel oil and carbon black, which has a high utilized value in the market. From this respect, we can know that the production cost is lower than the industry cost, and then as for the technology, we has introduced the international top technology that is called the zero separation technology. In this way, the whole production efficiency has been largely increased, and the quality of products is also beyond question. In addition to the technology, the structure of the pyrolysis plant for sale and service attitude are also top-ranking. First, the devices of pyrolysis machines are made up of condenser system, hydroseal system, dedusting system and draft fan system, etc. All of these can not only help us produce the best products but also realize the environmental protection. Second is about the reactor, which is the most important part in the whole operation and decides the service time of the whole set of plant. So we believe that most of customers pay more attention to it. On this point, our waste plastic and tyre pyrolysis equipment have used the special material that is durable and high-temperature resistance, which can efficiently extend the using time of the plant to save more pyrolysis plant cost indirectly. Generally, after shopping, we also have a trouble in the after-sales services. 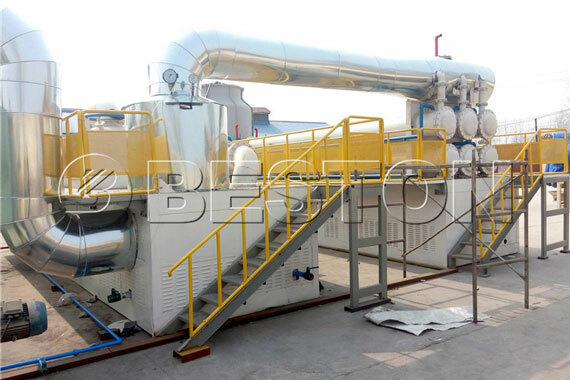 As for Beston waste pyrolysis plant, we have made a related perfect service rules with the first-class service attitude. We guarantee that we are responsible for the installation and checking of the whole set of machines, and we can also freely guide and train the workers. In addition, the guarantee period is one year, which has never appeared in others. Everything we have done is responsible for our clients, and we sincerely hope to provide the best products for you. So if you have any advice and questions, please call us or leave your messages,. We are overwhelmed with gratitude and reply you as soon as possible.